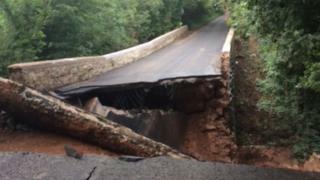 A bridge on the Iniscarn Road near Desertmartin, County Londonderry has partially collapsed. The country road has been closed in both directions. Engineers from the Department for Infrastructure are expected to carry out a full assessment of the damage later. DUP councillor for Moyola Anne Forde described the collapse as a bit of a calamity, adding that she thought last week's storms had weakened the bridge. "Some time ago there was a wee bit of work done to it but the weather we had last week, I have been led to believe the structure may have been damaged," she told BBC News NI. "There would be a considerable amount of traffic using and it a lot of famers would use it." A local diversion has been put in place. A spokesperson for the Department for Infrastructure said: "The extent of the damage will require full assessment by departmental bridge engineers." The PSNI tweeted: "To avoid current closure at Iniscarn Road drivers coming from Draperstown must go right onto Brackaghlislea Road and then left onto Gortahurk Road."